Fuel costs is <$1.50 per gallon equivalent now, while gasoline is >$2.40/gallon. 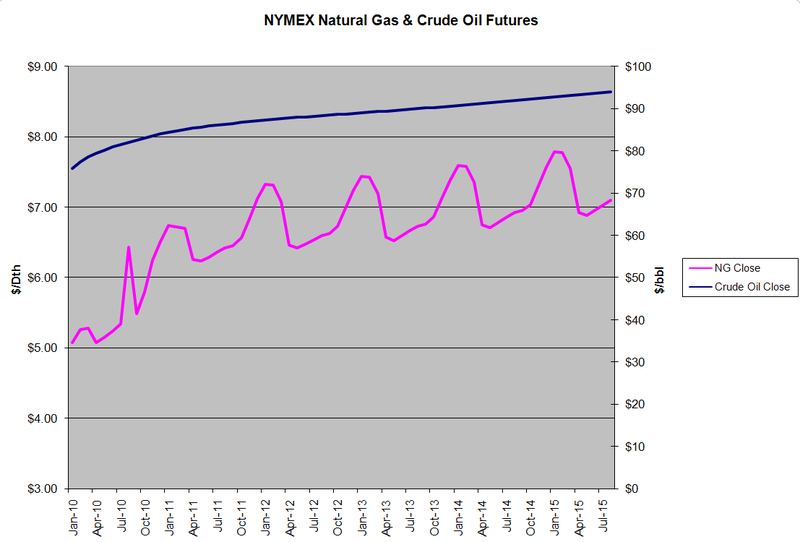 Futures of crude oil and natural gas indicate that this price disparity will continue for years. The natural gas price runup to $14/Dth in 2008 caused producers to find enormous natural gas supplies in the Fayetteville, Marcellus, Haynesville, Eagle Ford, and other shale plays. The increase in natural gas reserves is huge and the recognition of this supply is reflected in the natural gas futures price. 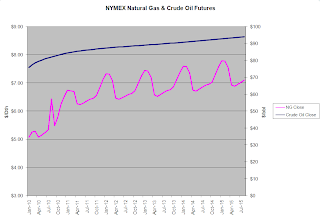 Abundance of domestic natural gas - What happens if everyone buys a CNG fueled vehicle? If 50% of the 27 quadrillon Btu's consumed in the US transportation sector were converted to CNG, it would increase the natural gas consumption by 60%. Given the large domestic natural gas supply and existing distribution infrastructure, this seems feasible - at the price point of current futures. Federal and Oklahoma income tax credits fully fund the incremental cost of the Honda Civic GX over the gasoline powered equivalent Civic LX ($6,900). Note this is a "credit", not a "deduction". Sufficent number of CNG fueling locations for nearly all my travels (see cngprices.com). Given previously stated advantages and the cleaner burning qualities and lower greenhouse gas emissions of CNG, I'm expecting adoption of CNG fueled vehicles to accelerate, which will drive construction of even more CNG fueling dispensers. Since the natural gas distribution system is already in place, all that is required to setup a new fueling station is a natural gas compressor system, which can be substantially funded with federal and state tax incentives. CNG technology is here now; batteries to fuel electric or plug-in hybrids are still in development. Even when available, the Chevy Volt's batteries will weigh about 400 pounds and contain the equivalent energy of a gallon of gasoline. I think batteries could eventually be a good alternative - they would achieve the objective of switching the US transportation fuel from foreign energy supplies to domestic (wind, coal, natural gas, nuclear, hydro, solar, etc.). Why are water heaters that are located adjacent to or in garages elevated? In a car crash, where does most of the gasoline end up? Would anyone consider plumbing their house with gasoline?